Thanks, Donna! Great to hear thoughts like these. Beautiful colours in that big rooster Kathy great stuff ! Thank you, Carolyn! Much appreciate your visit! you have incredible colors and very beautiful paintings! Awesome! Love, love this! 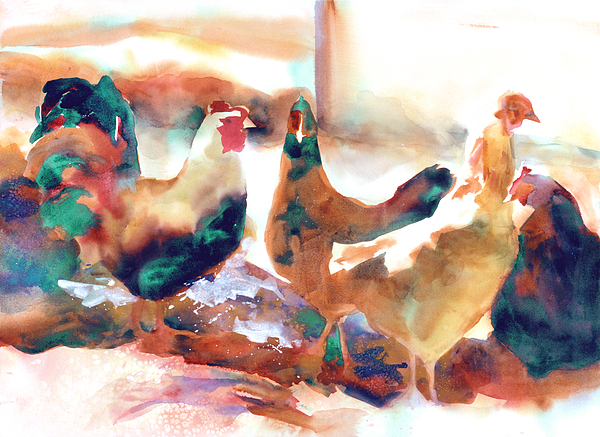 Love chickens in art and your colors and lighting are always fabulous!! v/f/pin! Thank you, for the lovely comment, Lenore. Lovely painting of farm animals! L F excellent painting of these chickens. They remind me of seeing the wild chickens in the Hawaiian Islands. They had a disaster there and could not catch all the chickens that were let free. Now they breed in the wild. Thank you Linda. Lovely comment. thanks for sharing and support. Thanks Sandra! Love your comment. Thanks Chris for the great comment about my painting! and thank you for the feature on the 500 views shared group. Very wonderful! Thank you Madalena! Yes, I really like to find a path of light in my compositions. From across the room , this one can look so abstract..... then you SEE IT. Beautiful watercolor! :) Featured on Just Chickens! Thank you Anita for the Feature on Just Chickens. This original sold after being exhibited in the Minnesota State Fair juried art show. I appreciate your visit! Thank you, Leanne. Abstracts are fun! Thank you Randy for the crowing account. Love it! Thanks for the promotions too. 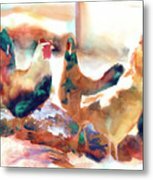 Kenny, Thank you for visiting my colorful chicken family and sharing in the promotion. This particular way of application of color was a fun. I used pigment color shifts with minimal brush work and then tipped the paper to mix the pigment. Magic happens! Thanks Ana, I like to save the white of the paper as it is so strong a color. Kathy, your art is wonderful, what a great gallery.. I,m so glad you commented on my art.. now I know where you are.. Thanks Sharon and I know where you are also! Thank you Dianne! Great abstract too. What a fun painting! I, too, love the splash of color - it makes the birds come alive :) Great piece! 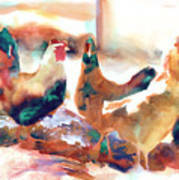 what a delightful painting, Kathy...I love the 'splash' of colors....the poses of the brood..really wonderful work! and thank you for your recent visit!